Tsum Tsum, meaning "Stack Stack" in Japanese, is the latest explosion of cute and cuddly plush soft toys to be sold at the Japanese Disney Stores. The idea is that these small plushes can be stacked on top of one another to create limitless combinations of great mountains of adorable furry Disney friends that simply ooze cuteness! They actually come in varying sizes, but the "regular" size is actually the smallest - and probably considered the cutest by the Japanese - and has the greatest number of characters available. The US stores (both online and in store) have recently started selling Tsum Tsums and the collection of characters avaiable has been growing. 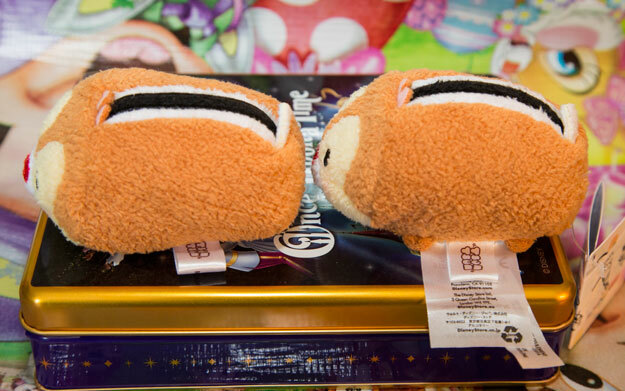 The US Parks, Disneyland Paris, and Hong Kong Disneyland have also started selling Tsum Tsums. Tuesday, June 19, 2018 - Happy Tsum Tsum Tuesday! Mulan Tsum Tsums now available! Tuesday, May 22, 2018 - Tsum Tsum Plush News! Figment, Dreamfinder, Roger Rabbit, and Wall-E Tsum Tsums coming soon! Monday, May 7, 2018 - Tsum Tsum Plush News! DuckTales Tsum Tsums now available! Wednesday, April 25, 2018 - Tsum Tsum Plush News! Summer Sea Life and Retro Chic sets now available at the Disney Store along with Rainbow Unicorn! Tuesday, April 3, 2018 - Tsum Tsum Plush News! 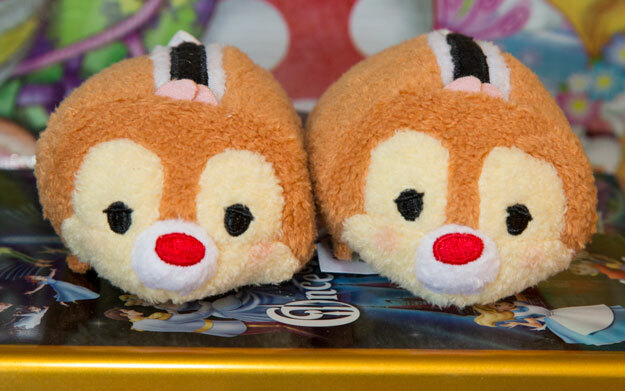 Disney Store releases Chip and Dale 75th and 50s Diner Sets! Tuesday, March 6, 2018 - Happy Tsum Tsum Tuesday! Disney Store releases Winnie the Pooh Easter set! Tuesday, February 13, 2018 - Happy Tsum Tsum Tuesday! Pocahontas Tsum Tsums released! Thursday, February 8, 2018 - Tsum Tsum Plush News! New Peter Pan Tsum Tsums arrived at Disneyland Paris! Tuesday, February 6, 2018 - Tsum Tsum Plush News! Main Street USA Tsum Tsums now available on line! Friday, January 26, 2018 - Tsum Tsum Plush News! D23 Expo Japan Kingdom Hearts Set released! Since the launch of Tsum Tsum, an increasing number of different characters have become available around the world. Originally they always appeared in Japan first; however, recently some (but not all) characters have been appearing at the Disney Store or the Parks first. In addition to all the different characters the Mickey and friends characters (including Mickey, Minnie, Donald, Daisy, Goofy, Pluto, Chip and Dale) also tend to get special variations for different seasons, including Christmas and Halloween. Most of the seasonal collections have been only released in Japan; however, there have been exceptions. New collections of characters have been added regularly as well as miscellaneous other characters. In January the US (and European) Disney Store started "Tsum Tsum Tuesdays" where they released a new range on the first Tuesday of every month. You can see a fairly complete list of characters that are or have been available on our characters page here. The availability of Tsum Tsums can vary from country to country; however, Disney is steadily adding more and more to the range and increasing availability. Currently you can find Tsum Tsums at the US Disney Store (online as well as in store), European Disney Stores, the US Disney Parks (at the World of Disney stores), Japanese Disney Stores, Hong Kong Disneyland, Disneyland Paris, Clinton's in the UK and are coming soon to the Disney Store UK. A limited number of characters have also recently appeared at Target in the US. Tokyo, where Tsum Tsums started, tends to get the greatest variety, and nearly always get seasonal variations. Disneyland Paris seems to have one core range of them, including some that are not available in the US yet like the Three Little Pigs. Hong Kong Disneyland seems to get what Japan has, but not as many, for example they got the Halloween ones from Japanese Disney Store while the US did not. If you are looking for Japanese exclusive Tsum Tsums we have had success with Disney Dream Store from Japan. That is how we get most of our Japanese Tsum Tsums! There can be minor differences between the Japanese Disney Store, the US Disney store, Disney Parks, Clinton's, and Target version of a character. For the most part they are very similar. 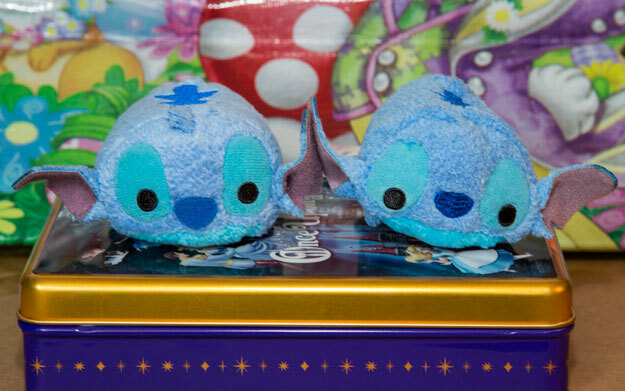 One example of a difference is Stitch where his nose is a felt aplique in the Japanese version while it is embroidered in the US version. The most noticeable difference are the tags that are sewn onto the plush; however, it is entirely possible the Japanese Disney Store will standardize the tags in the future as the tags on the US Tsum Tsums list the Japanese Disney Store on them. The Tsum Tsums sold in the parks have Disney Parks tags. Recently, Tsum Tsums were released in the UK at a 3rd party store and those too can be slightly different with different tags. In the US the Tsum Tsums that have arrived at Target have a "Disney Collection" tag. Japanese Stich on left, US on right. Japanese Dale on left, US on right. Japanese tags on left, US on right.